I have some polyester fabric for the stole, and I'm wondering if I need a canvas inside? The fabric is fairly heavy, and I planned to use it on the front and back. You suggest satin for the back. Is there a special reason why you prefer that to the same fabric? If I use canvas, what kind do you suggest? There are several types. You suggest basting the canvas on the satin on back, and then hand sewing together. I was wondering if you could sew it front and back, front to front and then turn it right side out? About how long should a stole be? Should they go to the hem of a robe or if you aren't wearing a robe, how long would be a good length or is it just a personal choice? Comments for Canvas for the stole? Yes, you will indeed need canvas when making a stole. It's a pretty crucial part of the stole because otherwise, it won't hang right. As far as what kind of canvas you need, any kind will do, so go to your local fabric store and buy your canvas there to save on costs. The reason we recommend satin for the lining is because it's pretty and not expensive. 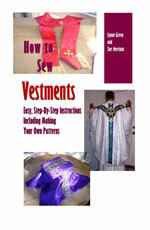 If you prefer using the same fabric for both sides, that will work as well. You also asked if you could just place right sides of the stole together (fabric and lining), machine-stitch it, and then turn it inside out. Unfortunately, the answer is no, you can't. I tried that once, and it looked awful. The only way you can make it hang right is to hand stitch it together the way we specify it on our stole page. As for how long a stole should be, the nice thing about making a custom-made stole is you can make it the length that will work for you. I always make my stoles 47 inches on both sides for a total length of 94 inches. But if your priest isn't as tall, you could make the stole shorter. I've seen priests with stoles longer, shorter, and exactly even with their chasuble. I don't think it matters as it depends on your priest's height. Please note: If you are interested in making a stole, you can purchase a stole pattern by clicking here.